We are pleased to announce you that Professor Guenter Mueller, University of Freiburg will give a talk at NII. * Title: Why business processes are not secure ? Cases like Worldcom, Societee General show how easy it is to manipulate digital business processes to reach deviating outcomes. One approach to counter this is process mining. Logs are analyzed and compared to business models. Experiences with a posteri process mining are discussed. We are the first in the world to develop new technology for accurately detecting hyper-realistic forged videos: deepfake and face2face. Traditional image forensics techniques are usually not well suited to videos due to their compression that strongly degrades the data. Thus, we follow a deep learning approach and build two networks, both with a low number of layers to focus on mesoscopic properties of the image. We evaluate those fast networks on both an existing dataset and a dataset we have constituted from online videos. Our tests demonstrate a successful detection for more than 98% for deepfake and 95% for face2face. MesoNet: a Compact Facial Video Forgery Detection Network, Darius Afchar, Vincent Nozick, Junichi Yamagishi and Isao Echizen, in IEEE Workshop on Information Forensics and Security, WIFS, December 2018. An improved version of PrivacyVisor is now being crowdfunded by Sabae city, eyeglass capital in Japan. News video titled "'Peace' signs risk fingerprint theft, says Japanese study" is released from Reuters. * Based on performance, successful applicants may be named Assistant Professor by Special Appointment. Directions: 3-5 minutes walk from exit A9 of the Jimbocho subway station on the Toei Shinjuku Line, or from exit 1b of the Takebashi subway station on the Tozai Line (refer to the map at http://www.nii.ac.jp/en/about/access). Applicants should hold or expect to hold a doctoral degree or equivalent academic credential by the appointment date. Note that preference will be shown to applicants with experience and knowledge of more than one of the areas listed in Item 5 above. * The starting date may be updated based on assessment of work, current status of work, budgetary consideration, etc. However, under no circumstances will the job go beyond March 31, 2018. The contract may be renewed on a yearly basis. * Days off: Saturdays, Sundays, public holidays, and year-end and New Year's holidays (December 29 - January 3). * Summer vacation: Any two consecutive days between August 12 and 18, excluding Saturdays and Sundays. Seven hours and 45 minutes per day under a discretionary work system. Employment and workers' compensation insurance covered by the Ministry of Education, Culture, Sports, Science and Technology Mutual Aid Association in accordance with laws and regulations. Mail the following documents to Echizen Laboratory, and write on the envelop "Application for postdoc fellowship position at Echizen Laboratory" in red ink: Curriculum vitae (including academic records, degrees, awards and prizes, return address, and photograph), a list of publications (divided clearly into refereed journal papers and others), copies of three relevant papers, a brief summary of research and related contributions (up to one A4 page in length), and the name and address of one personal reference who can speak on behalf of the applicant. After reviewing application documents, interviews will be arranged with applicants where required. All travel and accommodation expenses incurred in connection with the selection process shall be borne by the applicants. Applicants will be promptly notified of the results of the selection process. Application must be received by Monday, February 20, 2017 (screening can be conducted at any time, and the selection process will be terminated when successful applicants have been chosen). E-mail: iechizen (at) nii.ac.jp (replace (at) with @ when sending email). Please send all inquiries by e-mail to the address shown in Item 17 above. Please include "Echizen Laboratory postdoctoral fellow application" in the subject line. * Application document will be used solely for the purpose of assessing applicants. At the conclusion of the selection process, all application documents will be destroyed (and cannot be returned) except for those of the successful applicants, which will be used to provide personnel, employment, and salary details. Title : Breaking Anonymity of Social Network Accounts by Using Coordinated and Extensible Classifiers based on Machine Learning, e-Services and e-Society, LNCS 9844, pp.455-470, Swansea, UK, Sep, 2016. There is no security in IoT (Internet of things) especially not in Industry 4.0, unless the concept of security is modified in two directions:? If access control no longer only includes user identities and if authentication not only examines PII (Personal Identity Information) but demands proof according to rules, then security is possible. If authorization not only means that a given user identity is included in the access control list but a proven functionality, then security is possible. ?This talk presents new set of heuristic approaches to security since finding an optimal solution seems impossible or impractical, while heuristic detection methods can be used to speed up the process of finding a satisfactory solution for security in IoT. ?For this purpose Petri-Nets of the are used for the proof for rules and functionality. In this talk it is assumed that ?Industry 4.0 processes are logged and analyzed according to security relevant criteria; e.g. obstruction, behavioral deviation, resource and time or Performance Clustering.? Deviation from expected behavior is considered a hint for potential security issues, but it is not a proof of security violations. We are pleased to announce you that Professor Edgar Weippl, Vienna University of Technology, will give a talk at NII. which) to mitigate this risk. Edgar R. Weippl is member of the editorial board of Elsevier’s Computers & Security (COSE), organizes the ARES conference and was General Chair of SACMAT 2015, PC Chair of Esorics 2015 and is General Chair of ACM CCS 2016. He is member of many PCs including ACM CCS and Esorics. In 2015 he received the ACM SIGSAC Service Award. 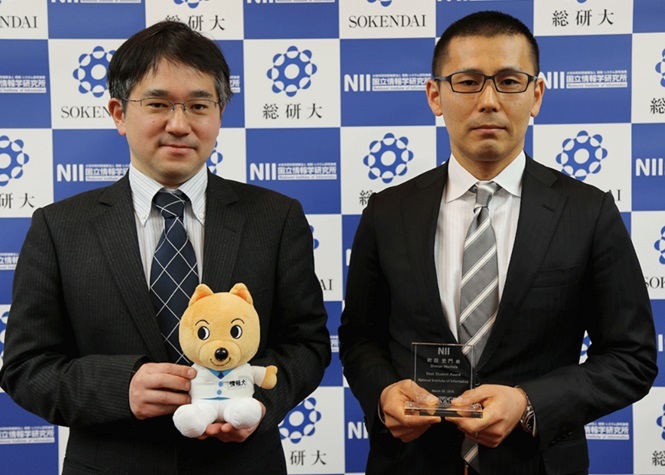 PrivacyVisor was released by Nissey Corp.
Shimon Machida (Ph.D. candidate) won the NII Best Student Award. 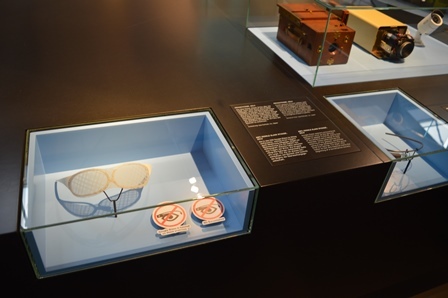 PrivacyVisor has been selected and shown on permanent exhibition (The Network) of German Museum of Technology (Deutsches Technikmuseum) since September 2015. We are pleased to announce you that Professor Guenter Mueller, University of Freiburg will give a talk at NII. You are most welcome to come and join us. * Title: BitCoin - Better than Money? The presently dominating money system has huge transaction costs. These are the profits of the financial organizations and the speculation in exchange rates and prices. The term financial industry implicates an independence from the real economy. Bubbles show that this is an illusion. Bubbles happen when too much money is available, and thus money must be destroyed. CryptoCurrencies can theoretically solve this, and BitCoin is the most advanced cryptosystem. It is not the first, but the most accepted CryptoCurrency. Decentralization by eliminating banks resulted in reduction of transaction cost. Control of money is done by cryptographic algorithms and under the observation of the whole net community in the block chain. This idealistic picture has recently experienced severe damages. Several criminal cases, like the theft at Mt Gox or the money laundering in Silkroad, but also the limited privacy as well as the in transparent decision making of anonymous centralized bodies to solve doublespending and volatility of exchange rates has caused comments that CryptoCurrency at its present state of development supports rather criminals than normal users. We are pleased to announce you that Dr. Ioannis Krontiris, Goethe University Frankfurt, Germany will give a talk at NII. You are most welcome to come and join us. * Title: "Privacy Attribute-Based Credentials in practice - concepts and trials"
When using the Internet people leave various digital tracks that are being used for profiling and identification. Although privacy-enhancing technologies (PETs) can help online users to protect their privacy effectively, not many of them have found their way into the everyday life. Most frequently stated reasons for the poor adoption are the difficulties for non-specialists to grasp the purpose of the technologies and the necessity of privacy protection, and also poor usability of the tools. Privacy Attribute-Based Credentials (Privacy-ABCs) is a specific PET that allows users to minimally disclose certified information when authenticating with online service providers. The EU-project ABC4Trust tests for the first time this technology with large-scale user trials and brings it closer to practical adoption. In this presentation we will discuss the possibilities that Privacy-ABCs have to offer for privacy protection and then focus on the experiences from the project and especially from the trials, discussing how the users interacted with the technology. Dr. Ioannis Krontiris is a senior researcher in the Deutsche Telekom Chair of Mobile Business & Multilateral Security at Goethe University Frankfurt, Germany. Dr. Krontiris holds a Ph.D. in Computer Science from Mannheim University, Germany and a M.Sc. in Information Networking from Carnegie Mellon University, USA. His research focuses on identity management, online privacy, and privacy in mobile applications. He is technical coordinator of ABC4Trust, an EU-project that investigates common architectures for privacy respecting attribute based credential systems and their deployment in practice. He is also the chair of the IFIP WG11.2 on Pervasive Systems Security. * Title: "Is Privacy an inferior property in Smart Grids?" Smart Meters allow the remote collection of fine-grained readings to support energy management. It is expected that energy consumption will be reduced and a load management for renewable energy is possible. In the US, but especially in Germany and in the European Union Directive 2009/72/EC promotes the deployment of smart grids. It states that, where initial pilots are positive, 80% of consumers shall be equipped with smart meters by year 2020. Experiences in the United States and Holland have shown that such an efficiency oriented legislation leaves consumers without choice but to accept the associated privacy threats. The success of the infrastructure remains limited. Till to date, policy tools, e.g. data protection laws or voluntary regulation, represent the only employed protective measures against privacy invasions by outsiders or insiders of the energy industry. The talk discusses the European and German approaches and will show in so called feedback loops that pseudonyms have deficits. In the European project IUrban, the author is responsible for privacy mechanisms to be studied in experimental smart grids of the city of Rijeka in Croatia and Plowdiv in Bulgaria. The objective is to reach both privacy and efficiency in energy management. Austria will be giving four lectures at NII. We are pleased to announce you that Dr. Klaus Rechert, University of Freiburg will give a talk at NII. You are most welcome to come and join us. * Title: "Securing access to complex electronic business processes and research data: requirements, challenges and lessons learned"
The information age has changed the economic landscape and research environments thoroughly. Nearly every piece of valuable scientific or business information is created, transferred and stored digitally. Moreover, the information is not necessarily bound to single, easy identifiable digital objects but can be embedded in complex (business) processes, which may include multiple interconnected machines. 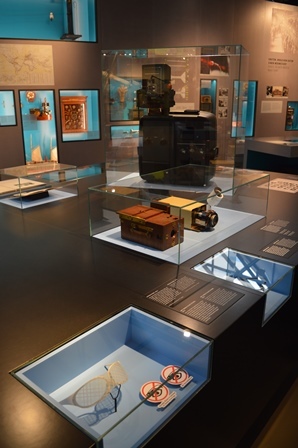 In terms of digital objects and environments even ten years are a huge timespan when trying to keep them accessible and usable as they are threatened by constantly changing technologies and the associated risk of hardware and software obsolescence. Reconstructing and re-enacting these processes and associated digital objects, e.g. due to regulation or legislative requirements, a legal dispute or an audit, may be required at some point. Then, both authenticity of reproduction and associated costs will matter. Klaus Rechert is currently the project coordinator of state-wide initiative on research data management and long-term accessibility of research data. His research focus is on privacy protection in complex data and digital forensics. 2010 Klaus was a guest lecturer at Malta College of Art, Science & Technology. From Oct. 2010 - Mar. 2011 he was a visiting researcher at the National Institute of Informatics (NII) in Tokyo, Japan. Since 2013 Klaus holds doctoral degree from the University of Freiburg. In 2006 Klaus received the EXIST-Seed scholarship sponsored by the Federal Ministry of Economics and Technology. Klaus studied Computer Science and Economics at the University of Freiburg and received a Diploma in Computer Science in 2005. We are pleased to announce you that Dr. Volkmar Lotz, SAP Product Security Research will give a talk at NII. You are most welcome to come and join us. Trust issues still constitute a major barrier for businesses to enter the cloud. The risk of losing control over sensitive data and applications is frequently considered as more significant than the economic advantages offered by the cloud. SLAs only provide a partial remedy, since they increase transparency of the requirements and obligations, but do not by themselves enforce the rules and restrictions ? in case of violations a cloud customer needs to resort to contractual law, if such violations can be detected at all. Technology research has therefore been focusing on providing enforcement mechanisms that overcome the trust barrier: trust assumptions ? in particular those on benign behavior of cloud providers, cloud-based applications and their users ? are replaced by IT architectures and mechanisms that technically enforce the desired security properties in an explicitly defined application scenario and trust context. In this talk, we present three research directions and recent results, each of which addresses a different scenario and security context. While all of them are suited to reduce the level of trust that needs to be put on entities in the cloud, they differ with respect to the threat model covered, the cloud players addressed, the degree of enforcement that can be achieved and the strength of the remaining trust assumptions. Queries on encrypted databases allow outsourcing databases to the cloud while protecting them against disclosure to the cloud provider and its administrators without the need to retrieve the data for processing. Data are encrypted and queries are transformed in a way that they can be directly executed on the encrypted data, the results then being decrypted at the client. To support different types of queries at maximum possible level of security, different encryption schemes with specific properties (random, deterministic, order-preserving, homomorphic etc.) are deployed. Layering of the schemes ensures that a weaker algorithm is only used if it is needed to execute the query. We present a prototype implementation of this concept for SAP HANA, including optimizations balancing security and performance. Multi-party secure computing addresses scenarios, where joint computations involving several entities are to be performed over a cloud platform, where neither the cloud provider nor the participating entities can be trusted, and no trusted third party can be relied on. Examples of such computations include benchmarking and collaborative Supply Chain Management, where computation results are to be shared among the entities but the input parameters need to be kept secret. The challenge is to find cryptographic schemes that are both secure and efficient and scale to a large problem class. We present concepts and research prototypes that implement such schemes for the abovementioned application scenarios. The third research direction presented is Usage Control. Usage Control is an extension of access control where access to data is granted only with respect to certain obligations which restrict the behavior of the data processor. Such obligations include notification upon specific events, deletion after a specified period, data retention, or context restrictions. Obligations can be expressed through declarative policies attached to the data (“sticky policies”) which are enforced through specific policy decision and enforcement points which intercept the data access and monitor events. This solution does not replace trust, but focuses the possible degree of enforcement dependent on the applicable trust model. For instance, if the cloud provider can be trusted and data access occurs through the cloud platform’s persistency layer, obligations can be enforced through a policy aware database connector. If in addition the application can be trusted (but not its users), the scope of enforcement can be extended to the application’s local store. We present application prototypes for both scenarios and show the additional effort for policy evaluation can be minimized using in-memory databases for the policy store. All of the presented research areas contribute to overcome trust issues in the cloud, focusing on specific trust assumptions and application scenarios. With mature solutions emerging, the cloud can unfold its full potential while respecting the protection needs of sensitive businesses. Volkmar Lotz has more than 20 years experience in industrial research on Security and Software Engineering. He is heading SAP’s Product Security Research, a group of 35+ researchers investigating into applied research and innovative security solutions for modern software platforms, networked enterprises and Future Internet applications, covering the whole development and product life cycle. The group defines and executes SAP's security research agenda in alignment with SAP's business strategy and global research trends. Volkmar’s current research interests include Service Security, Data-centric Security, Security Engineering, Formal Methods and Compliance. Volkmar has published numerous scientific papers in his area of interest and is regularly serving on Programme Committees of internationally renowned conferences. He has been supervising various European projects, including large-scale integrated projects. Volkmar holds a diploma in Computer Science from the University of Kaiserslautern. `Privacy visor` has been covered in BBC News. `Privacy visor` has been covered in TIME and NBC news. We are pleased to announce you that Professor Alexander Pretschner, Technische Universitaet Muenchen will give a lecture at NII. Tender") and representations of that content (song.mp3; song.wav, etc.). a picture downloaded from the internet exists as pixmap (window? manager), as element in the browser-created DOM tree (application),? and as cache file (operating system). This requires the data flow? tracking capabilities to transcend the single layers to which they are? deployed. In distributed systems, it has turned out that another? system can be seen as another set of abstraction layers, thus? generalizing the basic model. Demo videos of this work available at http://www22.in.tum.de/forschung/distributed-usage-control/. ?In this talk, we present recent work on extending our approach to not? only protecting entire data items but possibly also fractions of data? items. This allows us to specify and enforce policies such as "not? more than 20% of the data may leave the system", evidently leading to? interesting questions concerning the interpretation of "20%", and if? the structure of data items cannot be exploited. We present a? respective model, an implementation, and first experimental results. Alexander Pretschner is a full professor of computer science at Technische Universitaet Muenchen. Prior appointments include a full professorship at Karlsruhe Institute of Technology; an adjunct associate professorship at TU Kaiserslautern; a group management position at the Fraunhofer Institute for Experimental Software Engineering in Kaiserslautern; guest professorships at the universities of Rennes, Trento, and Innsbruck; and a senior researcher's position at ETH Zurich. PhD degree from Technische Universitaet Muenchen; Master's degrees from Kansas University, on a Fulbright scholarship, and from RWTH Aachen.? Research interests include software engineering, specifically testing; and information security, specifically distributed data usage control. Recent awards include an IBM faculty award, a Google research award, and a Google focused research award. Member of the editorial board of the IEEE Transactions on Secure and Dependable Computing, the Journal of Software Testing, Verification, and Reliability, and the Journal of Software Systems Modeling; membership in ca. 90 program committees; organization of ca. 25 symposia; frequent invited speaker; frequent reviewer for national and international funding agencies. Assoc. Prof. Isao Echizen has been awarded as the Best Poster Award in International Workshop on Security (IWSEC) 2012. Takayuki Yamada won the NII Best Student Award. Abstract: I would explore what is unique about the payments business of banking and show that this is undergoing radical change in Europe. Based upon this structural change we have set up a company that processes payments and which has now become the market leader in Europe - and will aim to show why this has been such a success. However basic payments are shown to be only the first step in modern banking business. Innovations around payments are now developing with great speed - more from non-banks like Google, Paypal, Amazon - and it is shown how the banking industry can react to this. Indeed an active counter-strategy of developing innovations using a structured systematic approach is shown. This is a step to what may be considered a contradiction in terms: industrial production of innovations. 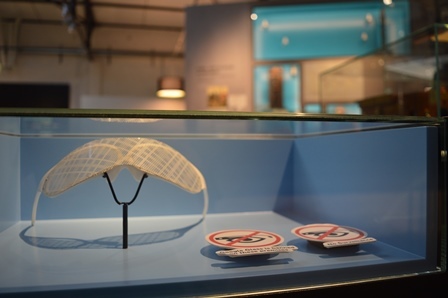 Some examples of the process to develop this are shown and some examples of concrete innovations which will address the challenges of the future. Copyright © ECHIZEN Laboratory, National Institute of Informatics. All rights reserved.